While Sichuan Province is still recovering from the earthquake disaster, southern China is now reeling under the effects of a massive rainstorm that hit 12 provinces, including Guizhou, Hunan, Guangxi, Jiangxi. Subsequent flooding has caused 56 deaths, 24 disappearances and wide spread damage. According to the Chinese regime's meteorology department, since May 27, a total of 46,900 square kilometers of 12 provinces in southwestern China, south China (Huanan), south of the Yangtze River (Jiangnan) , areas between the Yangtze River and the Huai River, east and northeast of the Yellow River and Huai River. These areas experienced over 100 millimeters of rainfall, and in all 449,400 square kilometers of land experienced over 50 millimeters of rainfall. Large-scale storms are also predicted to cover most of the Jiangnan and Huanan area, and will be centered in provinces such as Hunan, Jiangxi, and Guizhou, potentially causing grim flooding. Sichuan province, the location of the recent earthquake disaster, is also expected to experienced heavy rainstorms. In Guizhou Province, the worst hit area, 25 counties experienced heavy thunderstorms, which were accompanied by hail in some cases. In this region the storm left 36 dead, 14 missing, and over 3,000 destroyed houses in its wake. Hunan Provincial Flood Control and Drought Relief Headquarters points out that the continuing storm has caused great damage to local areas of Hunan Province. Six large cities, including Huaihua, Xiangxi, Zhangjiajie, Shaoyang, and Zhuzhou suffered various degrees of damage. As of May 30, there are 11 deaths and 11 disappearances as a result of this disaster. 70,000 mu (11,550 acres) of farmland were affected, over 2,000 houses have collapsed, and 47 kilometers of five major roads were destroyed. 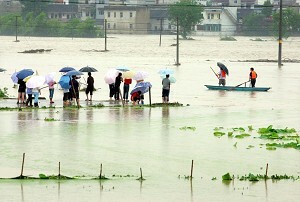 In Jiangxi Province around 10,000 houses were destroyed, and a total of 1,830,000 people are impacted. Flash floods and landslides caused at least 3 deaths and 2 disappearances. In another example of extreme weather this year in China, since May 27, central areas of eastern China and the western region of northeast China (Dongbei) experienced very strong sandstorms—to the extent that visibility within parts of Inner Mongolia's was reduced to less than 100 meters. The storms caused at least one death.